Sunny Wayne and Renjini Kunju surprised everyone by sharing their wedding picture. The couple tied the knot yesterday (April 10) at Guruvayur Temple in Kerala. The wedding ceremony was a low-key affair witnessed by the couple’s families and close friends. The couple decided to announce this special news by sharing a picture post the ceremony and everyone was taken by surprise. Since then fans and celebs have been showering the couple with good wishes and blessings. Sunny who couldn’t revert to everyone’s message personally, has shared another beautiful picture from the marriage and thanked all for their wishes and blessings. Sunny Wayne-Renjini Kunju Wedding: Actor Dileep Poses With the Newlywed’s, Nivin Pauly Extends Heartfelt Wishes. Malayalam actor Sunny Wayne took to the social media giant Facebook and shared a picture in which the couple is seen taking the pheras (traditional Hindu custom). He captioned it, “I want to thank every one from my bottom of my heart for making our special day extra special with all your wishes and blessings.I couldn't reply to all the messages personally. please consider this as my reply to all your love.” Dileep and Kavya Madhavan Visit Guruvayur for Daughter Mahalakshmi’s Choroonu Ceremony. 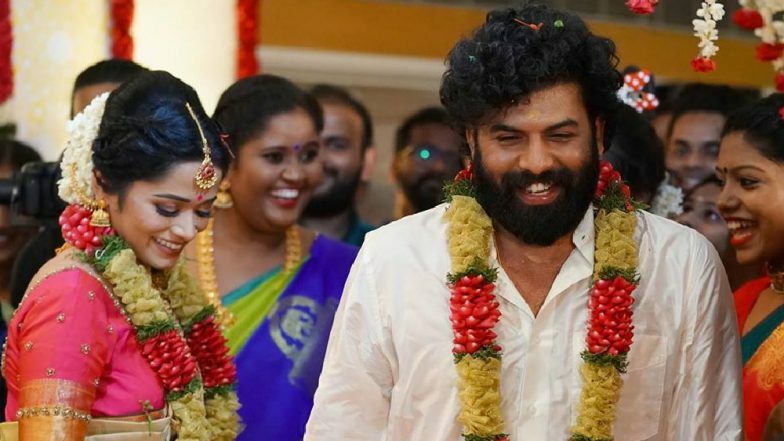 Sunny Wayne’s co-stars such as Nivin Pauly, Dulquer Salmaan, Aju Varghese and many others took to social media platforms to wish the newly married couple. In fact a picture of Dileep posing with Sunny and Renjini Kunju took the internet by storm. Dileep was present at Guruvayur along with his wife Kavya Madhavan for the choroonu ceremony of their daughter Mahalakshmi. That’s how Dileep happened to meet Sunny and Renjini post their wedding ceremony.